This minimalist heather navy Mens Graphic T Shirt made of wonderful Premium Cotton will make a perfect and modern gift for your son, husband, father, uncle or just for you. As it is made from the highest quality fabrics available. It has a super soft feel and is dimensionally-stable. 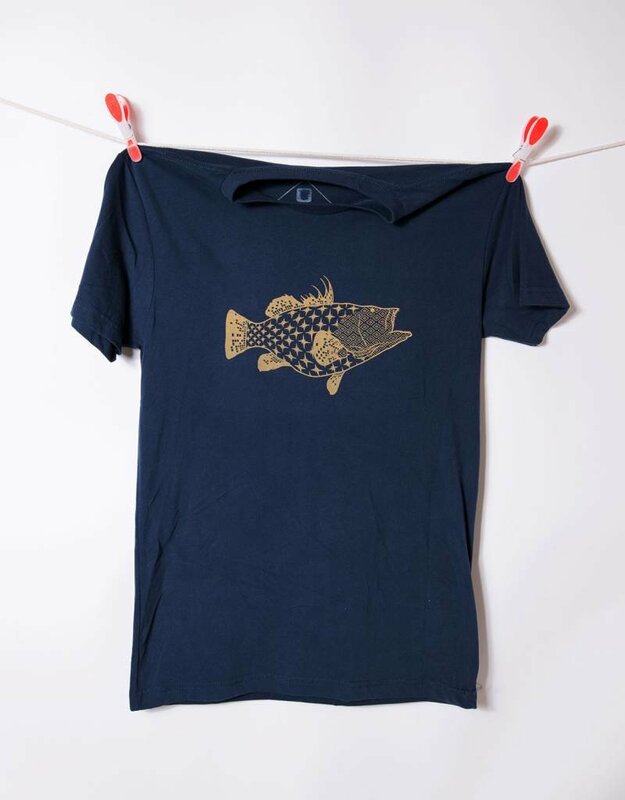 Great to wear and a sustainable addition to your t shirt collection or just the perfect present for everyone and every occasion. 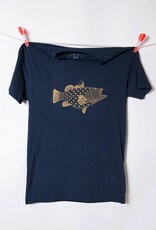 That Fish illustration has been screen printed by hand with eco-friendly - gold water based ink - onto a tinged navy shirt. Ink has been heat-set to resist fading. It can be worn alone or in layers. Limited edition print. 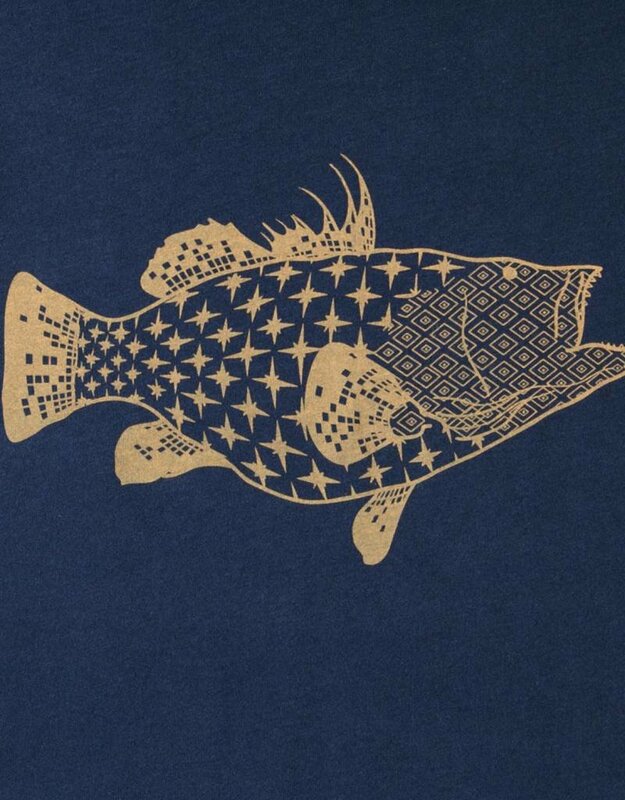 Threadwork products are handmade - screen prints made of water based ink - 100% formaldehyde free - made in Canada. Our t-shirts made of 60% Combed Cotton and 40% Polyester are super comfy, silky soft, great fit, dimensionally-stable and most important pre-shrunk. So you won't have to worry about shrinkage. Each item is precisely handmade with genuine love and passion by Threadwork in Ontario, Canada. Our requirement is always aesthetically minimalistic. Our designs are characterized by clear and pure lines, clean shapes and natural saturated color tones. We love simplicity and functionality not overdoing anything with too much and without compromising the design. Choose our minimalist and modern designs for you. Perfect and sustainable clothing for your family. Custom-made products for everyday use. Width...... Measure across the fullest part of the chest, from armpit to armpit (1 inch below). If you would like some customization to your item feel free to ask for a custom order made just for you! I will get back to you quickly and provide a special link for your custom order. Please tell me your Zip Code for exact shipping calculation. Thank you! CAN 3 - 10 business days +++ Free Shipping on all Canadian orders, USA 5 - 15 business days, EU 7 - 15 business days, Australia + Asia + Everywhere else 18 - 30 business days. If you would like to receive your order faster, please send me a short message before purchasing and I will calculate the Express Shipping costs, 2 - 8 business days delivery, just for you! That listing is for the T Shirt only. 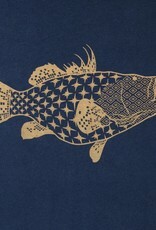 All other elements in the pictures are just decoration and were used for illustration purposes and will not be shipped. T shirt will be shipped properly and neatly packaged, protected from moisture. Please pay attention to the matter that colours may appear different on different monitors. Purchase of Threadwork Tees means that you are in agreement with Threadwork terms & conditions. © All items are designed and screen printed by Threadwork in Ontario, Canada. For additional questions feel free to contact me!